Set of eight unpainted wood colouring in pencils, a pencil sharpener and an eraser in a natural wood box. 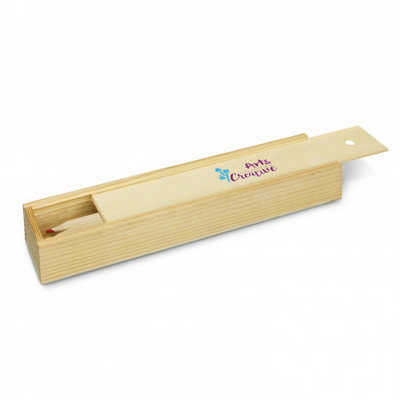 The box has a sliding lid which doubles as a ruler with metric and imperial graduations. Wood is a natural material which produces unavoidable variances in the grain pattern, colour and branding. Colours: Natural. Dimension: W 42mm x L 211mm x 30mm. Print Description: 40mm x 20mm. Print Type: Pad Print. Packing: Loose packed. Price includes : 1 Col 1 Pos Print. Setup is included.